Most of you reading this blog will probably know that we released our trailer a few days ago. We've been working hard on spreading the news, so that chipped away some development time. We've also been working hard on squashing some smaller bugs as we approach release. That being said, we are currently working on implementing the user accounts. Let's go over that today. Oh, and here's the trailer if you haven't seen it yet. The Official Scuttlers Announcement Trailer! With accounts, you'll be able to progress between games. As you play games, you'll earn Scuttle Points and Experience. Scuttle Points can be used in the shop, to buy chests that contain cosmetics. Nothing new here. Experience however, will advance your account level. Having a higher account level gives you bragging rights, sure, but that's not the main purpose. As you gain levels, you'll unlock new abilities that you can then use in your Loadout. 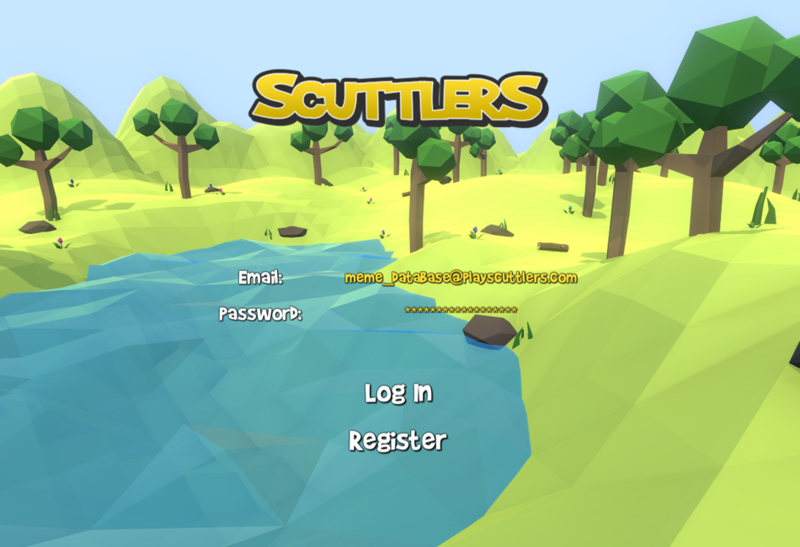 Just a screenshot of the login screen because I don't like walls of text. We'll do our best to make sure the abilities you unlock after some time, aren't just flat out stronger than their earlier-level counterparts. We don't want newer players to lose just because they're new. We can make high-level abilities a bit more complicated though, so we can add some depth without confusing the newer players. Last but not least, accounts give us the flexibility to add a lot of features in later development stages. For example, we could introduce a ranking system, profiles, and more. These are just examples though. When the game goes into Early Access, we'll gather feedback from you to figure out what exactly it is you want added to the game.